Bloody Big BATTLES Blog: Collected reviews of BBB - Bloody Big BATTLES! Collected reviews of BBB - Bloody Big BATTLES! In the two years since publication of the "Bloody Big Battles!" rules and the companion scenario book, "Bloody Big European Battles! ", BBB has had consistently positive feedback. Now seems an appropriate time to collate in a convenient place some of the many good reviews that BBB has received so far. Below is a list of links that will take you either to full reviews or to selected quotes. Wherever possible I have linked direct to the source. 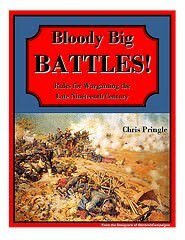 If you are interested in fighting large nineteenth-century battles and you aren't yet familiar with BBB, do yourself a favour and read what other players say about it. "The Foreign Correspondent", journal of the Continental Wars Society. Collected comments from many players. Keefsblogspot (by Keith Flint, author of the Honours of War SYW rules). Very thorough review for "Deep Fried Happy Mice" by Vincent Tsao. "Wargames, Soldiers & Strategy" magazine. and some battle reports such as Gettysburg. Don't Throw Bloody Spears at Me. "Lone Warrior" (Solo Wargamers Association), by Paul Le Long. "BBB has broken wargaming for me!"